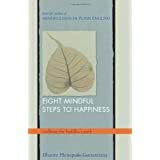 Eight Mindful Steps to Happiness: Walking the Buddha's Path ReviewBhante Henepola Gunaratana has summarized all of the Buddha's path to happiness, everything we know about affecting change in our lives, and everything that psychology teaches us about healthy living into a single, easy to read, easy to apply manual for happiness. This book is a gem! It can be used for inspiration, or instruction. It can be read countless times for added insight. If you are inclined toward Buddhism, or at least are taken with the Buddhist perspective, you will appreciate the straightforward approach he takes to describing the eight steps. If you are not Buddhist or so inclined, you might be put off with some of what you read (the Author clearly believes that the Buddha's way is THE way, and you might be inclined to think of Jesus as the way, or someone else), but I think any rational person would recognize the power and potential for creating change that is captured in this book. 2. Skillful Thinking - Emphasis on understanding how our attachment to things is the source of our suffering (letting go), the practice of loving-friendliness, and practicing compassion. 3. Skillful Speach - Special emphasis on truth-telling, gentle speach, and avoiding useless chatter. 4. Sillful Action - Particular attention to the Five Precepts, namely abstaining from killing, stealing, speaking falsely, sexual misconduct and misuse of intoxicants. 5. Skillful Livelihood - Understanding that how we make a living can have negative or positive impacts (skillful or unskillful) on our path to happiness. 6. Skillful Effort - Recognizing and dealing with the hindrances and fetters that keep us tied to our unhappiness. 7. Skillful Mindfulness - A study of mindfulness practice in terms of the body, feelings, the mind, and mental objects. 8. Skillful Concentration - Teaches what concentration means in the context of meditation, and how it is developed through the four stages to full Concentration. At each step, you'll recognize yourself and the things you do that hold you back from the path of happiness. You'll find solace in the knowledge that you are not alone (these are common to all us human beings), and relief in learning how to see things differently so that the world you live in works FOR you and not against you. Want to learn more information about Eight Mindful Steps to Happiness: Walking the Buddha's Path?